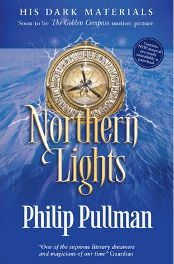 Northern Lights is the first novel in the His Dark Materials series by Phillip Pullman. First published in 1995, it was several years later that I became aware of it, perhaps when the series became popular. I borrowed Northern Lights from my parents about a year ago, but I’m ashamed to say I’ve only just got round to reading it, and then with the motivation of it being set for my reading group. Northern Lights is about Lyra, a twelve year old girl who suddenly finds herself at the centre of world events. The story takes place in a universe similar to our own, where locations are recognisable, but with a lot of differences. This world is also populated by witches and armoured bears. Another feature of this universe is that every person has a daemon, that is an animal that is tied to them as their soul and companion. Children’s daemons change forms, but as they become adults the daemon settles on one animal form which suits the person’s personality. I was utterly blown away by Northern Lights. I was hooked within pages by the story of this young girl and the events surrounding her. The story is gripping. At first it may seem like a straightforward good v. bad tale, but it really isn’t that simple as you get further into it. The lines between who is good and who is bad are no longer clear. The universe of Northern Lights is fantastic. It is beautifully written and all seems to make perfect sense – it seems natural that this is how life is there. Pullman doesn’t go out of his way to give explanations, so that things which are part of the fabric of life in this universe aren’t having to be explained in perhaps badly fitting dialogue. For example, daemons are introduced at the very start of the novel and with no explanation for the reader. You learn about them through chance remarks in the text, but also by simply figuring it out – as time goes on some things become obvious. I loved the daemons. The love and attachment between Lyra and her daemon Pantalaimon is beautifully written, and incredibly touching. The thought of separation is unbearable to them, and not particularly easy for the reader either. The novel is written in the third person, but generally from Lyra’s perspective. I think this style is perfect for the story: we follow our heroine closely and know her emotions, but we don’t have a twelve year old narrator. Pullman writes in a mature, polished and very accessible style. I’ve always been a fan of J.K. Rowling and the Harry Potter series, which I think are well written, but I think that Pullman’s writing is more intelligent, more polished. Northern Lights is easy to compare to Harry Potter, given the similarities of a child protagonist, similar but different world and a gripping story for adults and children. The character of Lyra is not always easy to get on with. I found myself swinging between adoring her and Pantalaimon, and getting irritated with her for being a bit arrogant. In fact, my favourite sections of the story were those involving both Lyra and Pantalaimon, not just Lyra on her own (human and daemon cannot be apart, but sometimes Pantalaimon was not a part of the narrative, although present). However, despite my uncertainty over the character of Lyra, I absolutely adored Northern Lights. I thought the story and setting were brilliant, gripping and interesting, I couldn’t put the book down. I can’t wait to continue reading the series, and I would not hesitate to recommend Northern Lights to adults and children alike. No Comments on "Northern Lights"